I have practiced Tai Chi for many years after being formally instructed only for a short period more than 30 years ago. I knew the 37 form and had what I thought was the right flow and feeling. It is clear however that practicing by myself with no instructions, and with many other commitments in life, it was inevitable for me to drift away from the principles of Tai Chi and retain the form only as a light exercise. I decided to finally seek a teacher that would help me rediscover (the roots of) Tai Chi. Prior to my last visit at NTU Singapore during two weeks in November 2017, I searched the internet and was most impressed with Sifu CHONG and his school. I met Sifu CHONG for the first time early morning in a residential park close to the Bishan Community Club. He asked me to show what I knew and shortly after I started he stopped me with "It's all wrong". Sifu CHONG then went on to instruct me for an hour on the principles or theory of Tai Chi which was precisely what I needed. I then continued to meet Sifu CHONG for a number of private sessions and also joined the group practice at Bishan and Toa Payoh. I was deeply inspired by Sifu CHONG practice of Tai Chi, how he fuses form and essence into a beautiful whole. Sifu CHONG explains the theory and principles of Tai Chi clearly, never mystifying but always on the edge of what can be rationally explained about the power of Tai Chi. 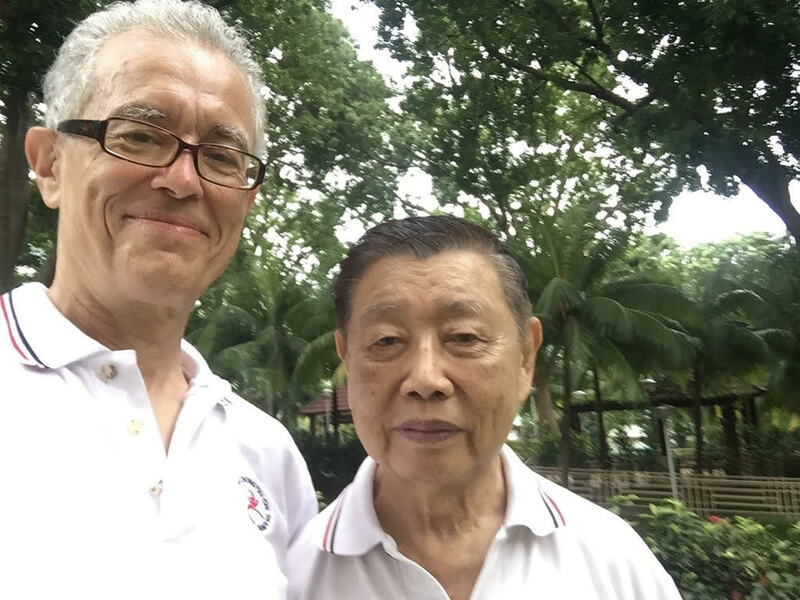 I was impressed by the exercises Sifu CHONG has developed which feel extremely useful for building up physical and mental strength for Tai Chi. With this frist hand experience I was entirely convinced that I had found the Tai Chi source for developing my practice. Tai Chi practice focuses on energy flow with the aim of restoring a physical-mental balance that is typically being lost in our busy lives. This balance can be achieved only by in some way (re)connecting the above with the below - or the Earth with the Heavens - within ourselves. A memorable point was when Sifu CHONG took off his shoe and showed me its sole: it had clearly worn out toe, circular middle and heal areas, clearly showing how to connect to the ground. (Re)discovering energy flow from the ground, straight up to the top of the head with the abdomen in the middle, is essential for good Tai Chi practice which was always vividly demonstrated by Sifu CHONG.